Co. Kildare: Athy (4), Ballybrackan (2), Castledermot (2), Davidstown (2), Kilberry, Monasterevan (2), Moone, Narraghmore. Queen's Co.: Ballyadams (2), Dysertenos, Killabin (2), Moyanna, Stradbally (2), Tullamoy. The Board also included 8 ex-officio Guardians, making a total of 32. The Guardians met each week on Wednesday. The population falling within the Union at the 1831 census had been 50,907 with Divisions ranging in size from Moyanna (population 1,652) to Athy itself (7,709). The new Athy Union workhouse was erected in 1842-43 on a 6.5-acre site half a mile to the north-west of Athy. Designed by the Poor Law Commissioners' architect George Wilkinson, the building was based on one of his standard plans to accommodate 600 inmates. Its construction cost £5,600 plus £1,030 for fittings etc. The site location and layout are shown on the 1907 map below. The workhouse was declared fit for the reception of paupers on 20th November 1843, and received its first admissions on 9th January 1844. During the famine in the mid-1840s, a straw shed was adapted to accommodate an additional 30 inmates, and sheds in the boys' and girls' yards accommodate a further 80 children under 4. Straw and turf sheds were fitted out for 30 fever patients. The buildings comprised a lodge and children's blocks flanking the entrance at the south-west. The main accommodation block had the Master's quarters at the centre, with male and female wings to each side. The present front porch is a later addition. 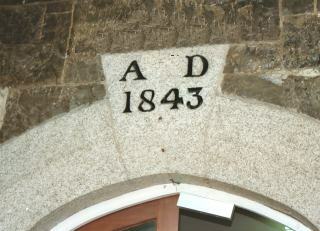 The original entrance doorway inside is capped by a date-stone. A central spine containing the chapel and dining-hall linked to the infirmary (now demolished) at the rear. In 1895, Athy was visited by a "commission" from the British Medical Journal investigating conditions in Irish workhouse infirmaries. Their report made a number of criticisms and recommendations. The nuns who were employed as nurses at the workhouse gained praise for the quality of the care they provided. However, they lacked formal training and were overstretched so that pauper inmates were used to assist with the nursing. Further details are available in the full report. In 1903, four nuns were being employed as nurses at the workhouse. After the creation of the Irish Free State in 1922, the workhouse was redesignated as a County Home for the aged and infirm, chronic invalids, and expectant mothers. By 1927, however, contrary to official policy, the Home was still housing a number of "mental defectives" and unmarried mothers and their children. The site is now (2002) the home of St Vincent's geriatric hospital. 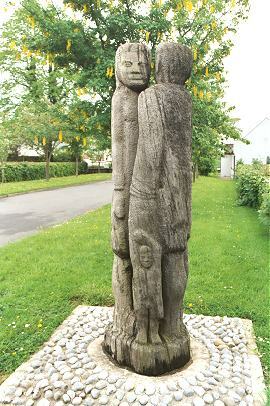 A sculpture commemorating the Great Famine stands at the entrance. Taafe, Frank (1994) 150 Years of Caring: A History of St Vincent's Hospital, Athy .